This is a very simple app that toggles Voodoo lagfix, then allows the user to reboot the phone. If this is all you needed to know, then here is a link to the .apk, and here is a qr if you want to grab it from the Android Market. 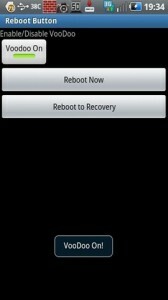 The method the app uses is simplicity itself: Upon boot, the Voodoo kernel looks in a directory on the phone’s SD card called “voodoo”. It’s looking for a file called “disable_lagfix”. If it sees this file, it reformats the internal SD card back to RFS, and you’re running normally. The app, upon startup, looks for the “disable_lagfix” file, then tells the user if Voodoo is installed, and if it is active. Pressing the toggle button either creates or deletes the “disable_lagfix” file. That’s it. 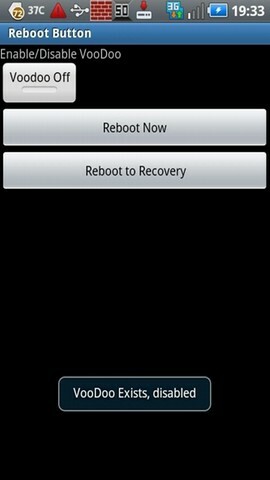 There are also two big buttons, one of which is a standard reboot, and the other reboots into recovery. This app has NO idiot-proofing, so I HIGHLY discourage toggling the lagfix, then booting into the recovery image, unless you have a firm idea of what you are doing, and need to do it this way. Remember, at this time there is no official support for Project Voodoo on the Samsung Fascinate or Epic 4G! In the near future that might all change, but for now, Voodoo on these devices is a potential minefield, you’ve been warned! Samsung, for some reason, uses a proprietary file system on the Galaxy S’ internal memory. This system, called RFS, is significantly slower than the current Linux standard filesystem, known as ext4. Now remember, Android is just a focused version of Linux, so it does seem a little strange that they decided to create their own, non-standard system, when there was a perfectly good, open standard system available. In any case, that’s what they did. Project Voodoo’s solution to this is to re-write the filesystem back into the Linux native ext4. This makes things go a lot more smoothly and quickly than on RFS, and is potentially a permanent solution to the lagginess that some Galaxy S users have experienced. So if this is so great, why do we need to toggle this on and off at all? Wouldn’t I just want to leave it running in the much improved state? Well, most of the time, yes, you would. However, the same personality traits that inspired you to do this in the first place are probably also pulling you in some other directions, and you might want to, at some point, make some additional changes, such as flashing new ROMs, updates, or any of the myriad other things we do that make phone hacking so much fun. Trouble is, at the moment, the tools we all know and love for doing all this (Clockworkmod Recovery being the most important example, IMHO) don’t expect to find, and therefore don’t recognize the ext4 filesystem, so no flashing while the Voodoo lagfix is running. So we have this little toggle, like I mentioned a couple paragraphs ago, the Voodoo system looks for this little file in a specific location, and based on the presence or absence of it, it will reformat the internal SD card to ext4 or RFS. So that’s what the Voodoo Lag fix does, and that’s why I wrote this simple little app. Uhhh, Dude, seriously, Thank YOU!! !